want to take a trip to hawai'i for the next nine months? what makes winter livable for you? Winter is here and one thing is for sure- I am not wearing nearly enough layers. I call it winter because the only discernible difference in the Pacific Northwest between fall and winter is the amount of daylight we get. Don't get me wrong, the evergreens we get to keep through the winter are ray of much needed color here in the winter time. But, a beautiful multi-colored fall full of crisp sunny days, complete with cozy scarves it is not. No leaves turning colors, sunny days are a always a few months away, and those beauteous scarves are just going to get soaked in the rain. As I have mentioned before, winter is not really my favorite season. But, there are a few redeeming qualities. Soup is one of them. Winter squash, Christmas, Hanukkah, Sweater dresses, boots, and baking are a few of the others. The first official soup of winter this year is a sort of comfort soup. 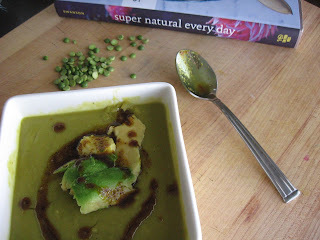 When I think of the broccoli soup of my youth it is always thick and cheezy and the only thing on the diner menu I can eat (along with grilled cheese of course). This soup reminds me of those diner soups but with a little more flair. It has beautiful specks of red pepper and carrot that make it prettier and tastier. We ate this soup with some olive bread crostini we got from a place called the Bread Farm. Mr. Man had seen an article awhile back about a small town north of us. Said article suggested this town as a day trip and offered a variety of things to do complete with a suggested schedule. We set out for said charming town. I used a low sodium broth for this soup. For most soups I like to be able to control the level of salt. I think this is particularly important for this soup because the cheddar can be so salty. Also, I have stated that the celery seed is optional because I don't like celery or it's flavor, but you might not agree with that assessment. So, you can add it if you want. I won't judge you. Not much, anyway. Melt the butter in a large heavy pan (use a Dutch oven if you've got one) over medium heat. Once the butter is melted add the garlic, onions, bell pepper, and carrot. Continue to cook it over medium heat for about 10 minutes or until the veggies are tender. Go ahead and measure out two cups of vegetable stock. To thicken the soup, add in the four and stir constantly for about two minutes. Then add the vegetable stock slowly while whisking continuously. One the mixture is smooth add the broccoli, potato, and celery seeds. Raise the heat to high and bring the soup to a boil. Then reduce the heat again, cover, and let it simmer. Stir occasionally. The vegetables should become tender in about 10 to 15 minutes depending on how large you chopped them. Once they have reached the tenderness you like to eat, stir in the milk. When the soup has become warm again, add the cheese and stir slowly. Add the dry mustard. Add salt and pepper to taste (I used about a quarter teaspoon of each). This soup goes great with crostini or crusty bread. I swear. I am not just trying to justify the long drive I went on last this past weekend. Labels: Recipes want to take a trip to hawai'i for the next nine months? what makes winter livable for you? What a very nice soup! I'm not so much a winter girl (hence living in LA), but I love snuggling up in one of my many colorful pashminas and getting that rosy glow that one only gets from running outside in the cold.